Among my list of absolute favorite places for food and drink in Baton Rouge is Sammy's Grill on Highland Road. Sammy's is a classic neighborhood bar and grill that has recently grown and expanded but has still, for the most part, retained the character that made it so great. The best place to sit is by far the bar area which used to also be the main dining room. If you can't sit there, the old patio which is now enclosed into a dining room is also good. I try to avoid the new dining area at all costs, but that's probably only because I remember the old days and still haven't adjusted. The grub is not your typical pub fair. The menu is diverse and features a lot of Louisiana favorites and daily specialties that always please. Many things on the menu could be considered some of the best of their kind in town including their homemade fried cheese, boiled crawfish (in season), poboys, house salad dressing, and chicken fried steak! I was joined at Sammy' Grill a few days ago by Paul who is still in town from Chicago, Brian, Eric, Brent, James, and Eusebio. It was pretty much exactly the same as the Chimes reunion group but sub Eusebio for Michael. We started with several buckets of domestic beer (mostly Coors Light, Budweiser, and Bud Light) as well as a couple orders of fried cheese with marinara sauce. We also ordered a coach's plate and subbed the tomatoes for fried mushrooms! Always a good decision. 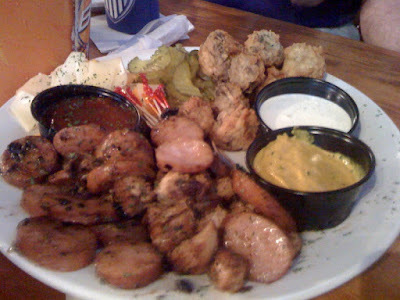 The coach's plate features chunks of grilled chicken breast, slices of pork sausage, little pieces of Swiss and American cheeses, pickles, and in our case, fried mushrooms, and is all served with mustard, barbeque sauce, ranch dressing, and enough toothpicks to skewer it all. It really is one of my favorite appetizers. It is so simple, yet so good every time (minus the pickles). For dinner I kept drinking beer along with the rest of the table and then eventually ordered the grilled shrimp poboy. I had heard a lot about this sandwich around town but had never actually ordered it before. Most shrimp poboys are fried, not grilled, so this was already a little unique. To add to the originality they topped the scrumptious shrimp with melted pepper jack cheese, sauteed onions and peppers, lettuce, and tomatoes. 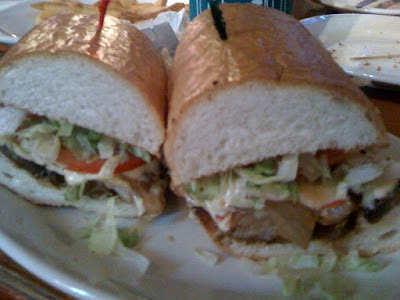 The poboy was as delightful as promised. The fresh french bread surrounds the flavors inside and every bite of the sandwich delivers a mix of flavors and textures that makes me all warm inside. My game plan was to have a few more Silver Bullets and Ice Cold Steveweisers (If you know the reference, good for you, and if you don't, then also good for you!) for dessert. That game plan worked out, but then we saw that they had a White Chocolate Bread Pudding on the menu and had to give it a try! The white chocolate sauce was fantastic but the bread pudding was very different, though good in its own way. It really had the texture of a cinnamon roll. It was not moist throughout and certainly was not reminiscent of a pudding of any kind. I'm a fan of daring to be different, and this was still a tasty dessert even if it is not what one traditionally thinks of as a bread pudding. 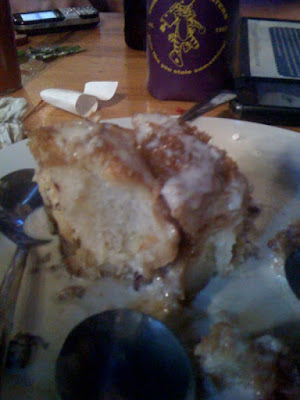 White Chocolate Bread Pudding at Sammy's... with a Third Row Koozie in the Background! Sammy's Grill is most certainly worth the visit. I recommend pretty much everything on the menu. And while you're there, get a table in the bar area, order some beer or cocktails, and stay a while! You'll be glad you did!